Officials have been forced to release water from the two largest dams, Bhumibol and Sirikit, into the Ping and Nan rivers, which feed into the Chao Phraya, said Smith Dharmasaroja, head of the Natural Disaster Warning Foundation. So why were the dams – there are plenty of others – allowed to get so full? Now having said that, to be fair, in June 2010 the dams hit record lows and if there as no water it would be the reverse problem. Is the problem too much unexpected rain this year or bad water management as Smith states? Could something have been done early on in the rainy season? In June and July, authorities released an average of 4.5 million cubic meters of water per day from Bhumibol Dam as the water level increased to 63 percent of capacity, double the amount stored in the same period a year earlier, according to data from the Royal Irrigation Department. The discharge increased to 22 million cubic meters per day on average in August and 26 million in September. From Oct. 1 to Oct. 14, as floods left hundreds of thousands scrambling for temporary shelter, an average of 77 million cubic meters has been released downstream each day, more than 17 times as much as in June and July, the data show. 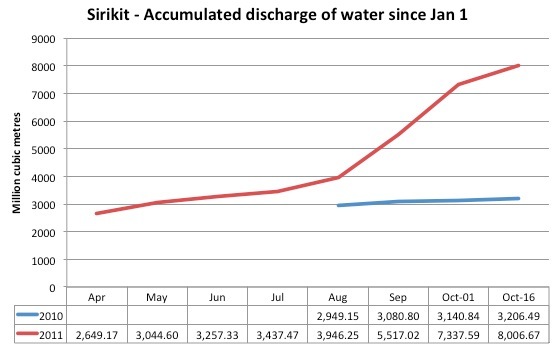 In Sirikit Dam, the country’s second-largest that feeds the flooded area, discharge rates averaged 54 million cubic meters per day from Aug. 1 to Oct. 14, five times more than in June and July, according to Irrigation Department data. On Aug. 1, the reservoir was 79 percent full, holding twice as much water as the same date a year earlier. Suthep Noipairoj, head of the Irrigation Department’s Office of Hydrology and Water Management, said discharges from the dams were reduced starting in April because some agriculture lands downstream were already flooded. NOTE: Capacity % refers to the dam capacity; MCM refers to million cubic meters released per day. All figures are calculated as of the first of each month only. 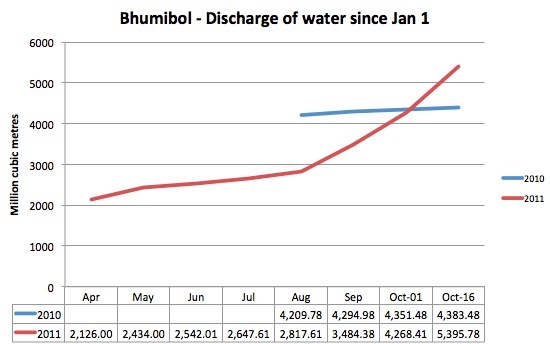 Unfortunately, BP doesn’t have the resources to calculate each day and then do an average of the month, but you can see the accumulated discharge of water counting from January 1 as per below which confirms how little water was discharged prior to the rainy season in 2011 to suddenly being discharged. Compare that with 2010. NOTE: Can only start from August in 2010 as data prior to that is not available. BP: Okay, last year was a low year, but in April, May, June, July and even up to August (being August 1), we are only having minimal discharges of water. This even though as of August 1, 2011 the dam is more than twice as full as 2010. Suddenly, water is starting to be discharged, but the flooding has already started now so further discharges starting in August has exacerbated the situation. This basically confirms what Dr. Smith is saying. Even though the capacity was higher/dam was fuller in June and July 2011 less water had been discharged up until sometime towards the end of September compared with 2010. There was a delay in discharging water and once the dam started to become too full, they suddenly had to discharge a lot of water starting in August. Why was this water not discharged earlier? You see that in 2010 they didn’t have this problem. BP: As least more water was being discharged earlier, but it was not enough as you can see they suddenly have to start discharging a lot of water in August. As this water flows into the rivers it goes downstream and hence has exacerbated any flooding. More than 80 per cent of the flood in the Brisbane River at its peak last Thursday was the direct result of the release from Wivenhoe, the city’s flood shield, of up to 30 per cent of its capacity, according to official data obtained by The Australian. The data shows that, without the unprecedented and massive release at a peak rate of 645,000 megalitres a day from the dam on Tuesday, January 11, the flooding in Brisbane would have been minimal. On a bridge above a flooded canal in Rangsit, Army Col. Wirat Nakjoo echoed the need to be vigilant. Government workers there were taking no chances, stacking new sandbags atop a canal-side wall about 4.5 feet high (1.4 meters high). BP: Will we receive an explanation as to why so little water was discharged in the dry season leading to the dams becoming fuller and fuller to the point that such a large daily discharge was required in the rainy season once the flooding had already started? The opposition party has made it clear that it will not want to take advantage of this mishap to attack the government, but those were areas identified by the Democrats for the prime minister to resolve, Democrat spokesman Chavanond Intarakomalyasut said. “The government had information about the water situation at all dams but complacency has led to a situation in which it is now trying to catch up with the problem instead of devising measures to cope with it beforehand,” Mr Chavanond said. Requests from Thailand’s Meteorological Department for a 4 billion baht ($130 million) overhaul of its radar and modeling systems have gone unheeded since 2009, deputy director-general Somchai Baimoung said. The new equipment would allow the department to more accurately forecast seasonal rains, he said, giving dam operators information needed to adjust water levels. Will briefly flag the issue, but it is likely to boil between the surface. Chart Thai Pattana controlled the Agriculture Ministry, who the Irrigation Department is under, in both the Abhisit and Yingluck governments. Frustration from Puea Thai is likely to boil over and may lead to them wanting Agriculture back. Chart Thai Pattana and the Minister in question has so far not faced many questions. Having said that EGAT also share responsibility as they also have “control”* over the dams. *Looked, but have yet to see a clear explanation on exactly how responsibility over the dams is divided up between the Irrigation Department and EGAT. Anyone? **[UPDATE: On whether seasonal forecasting is possible – see here and particularly here – although you have question of accuracy].